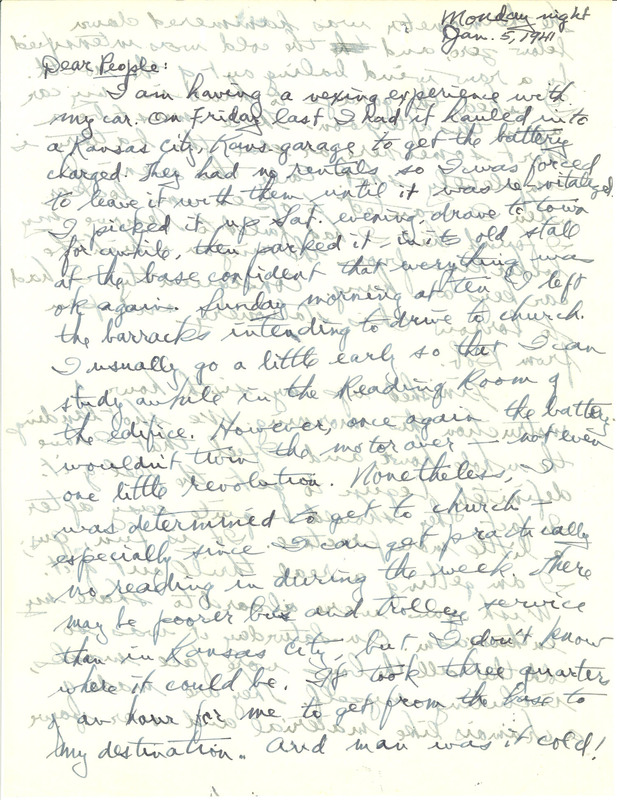 Monday night Jan. 5, 1941 Dear People: I am having a vexing experience with my car. On Friday last I had it hauled into a Kansas City, Kans. garage to get the battery charged. They had no rentals so I was forced to leave it with them until it was re-vitalized. I picked it up Sat. evening. drove to town for awhile, then parked it - in its old stall at the base confident that everything was ok again. Sunday morning after I left the barracks intending to drive to church. I usually go a little early so that I can study awhile in the Reading Room of the edifice. However, once again the battery. wouldn't turn the motor over - not even one little revolution. Nonetheless, I was determined to get to church - especially since I can get practically no reading in during the week. There may be poorer bus and trolley service than in Kansas City, but I don't know where it could be. It took three quarters of an hour for me to get from the base to my destination. And man was it cold!